May I introduce my second ARDUINO-project with own pcb. With the pcb I am able to drive seven brushless pumps(with integrated electronics). The “problem” with such kind of pumps is that they don’t accept unfiltered pwm-signals as supply voltage. So I created a circuit where the pwm-signals of an ARDUINO-micro are level-shifted to 12V with a darlington array and afterwards filtered with a 1 uF ceramic capacitor and a 730 Ohm resistor (low pass filter). The signals are then led into the adjust-pins of seven “lm317″s. To work properly I needed to connect the adjust-pins also with 2500 Ohm resistors to gnd, but I found out that with two l293d instead of the used TDP62783 (darlington array) these resistors are not needed, but different resistor and capacitor values for adequate filtering! The pums also have tacho signals which I connected via schottky-diodes to the ARDUINO (inputs with pullup). With the tacho-signals I am able to find out if pumps are stuck, are sucking air or are not connected. Additionally I added one ACS712-05B current sensor (which measures the entire current of the circuit) that could be used to find out if pumps that don’t have tacho-signals are working properly. At the moment it is not used. Besides that I integrated a lm386 audio-amp used to amplify the signal of an electret-mic to a level that is suitable for the ATEMGA’s ADC. 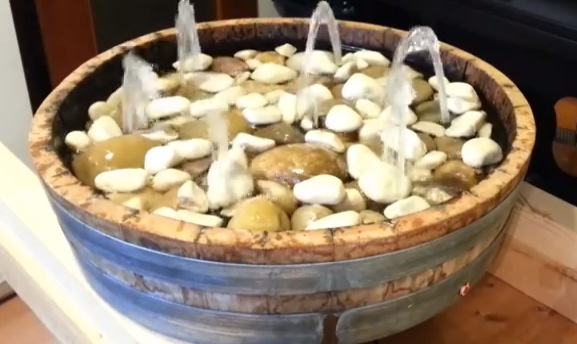 As the first project for the pcb I created a fountain consisting of a shortened wine barrel, seven brushless pumps, a pushbutton with led and pebbles (s. video). There are seven animation-modes which can be selected via the pushbutton (the selected mode is stored in eeprom). The speed of the pumps is checked permanently during operation. The average power consumption is ~20W and max. consumption is 30W. Discover the different modes to control it reading the description on youtube video. Wonderful! Nice job on the controller board – love the `single-point ground’ design in the layout. I wonder if you had to deal with the issue of run-away positive feedback – as when the sound of splashing water reaches the microphone? Yes, i have issues with feedback, but that “only” leads to slowed and stuttering decline of the fountains! Great job, I’m thinking of doing a similar project with water pumps. I was wondering which ones you decided to use. If you could point me in the right direction I’d really appreciate it. Thanks.